We all know how much fun our kids can have with a water balloon fight...oh OK us adults too! :) Right? :) Admit it!! Well, how about messy water balloons? 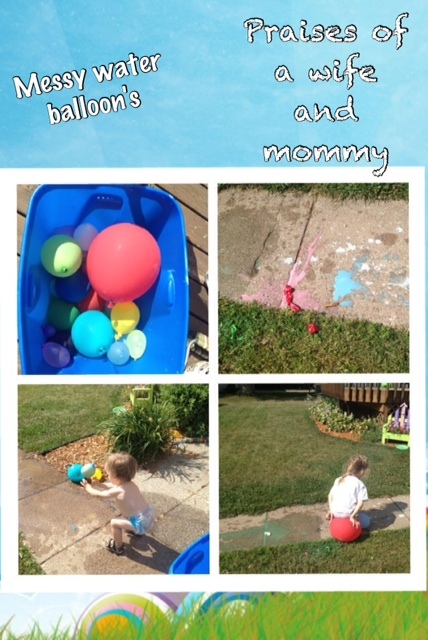 I used cornstarch, water, and food coloring to create a colorful experience with water balloons for my kids. The reason we added cornstarch is to ensure the food coloring does not stain the sidewalks. :) Then it becomes more chalk like when it dries. Clean up is super easy...wait for the rain or get the hose. We also made it a race to see who could get the most balloon pieces to clean those up. My children enjoyed throwing, sitting, stomping, rolling, and tossing the balloons back and forth. It was always exciting to see what color came out when the balloon popped. I am willing to bet that my daughter will be asking to do this activity again! :) :) My daughter wanted more balloons after she popped all of these but she will have to wait till next time. I bet she will want to do it again every day. It looks lads of fun.